"It's basically a Japanese omelette. Try it out!" Tamago (or Tamagoyaki) is Japanese for grilled egg, and as commonly used referring to the Japanese omelette used in sushi. Making it requires a rectangular pan, and some patience. Follow the instructions below to make your own omelette sushi. Attention – this recipe is followed by a flash illustrated guide on making the tamago omelet , which can be found here. Stir all ingredients together to creat a solid batter .Pick up a rectangular pan. Oil it, and cover it with tamago batter, 1cm deep. After 2-3 min, when the bottom of the omelet gets brownish, use a kitchen spoon to fold the omelet twice. First from the closer end towards the middle, and second towards the far end of the pan. There’s no need to flip the omelet, just fold it. Even if the upper side of the omelet seems uncooked before folding, the “inner layers” of the omelet will get done by the end of the process. Now oil the pan again (or not, depends if you prefer it crispy or oil free) and add another round of tamago batter. Notice that the batter you have just added should touch the omelet you folded in the last step. Repeat steps 2-3, until you run out of tamago batter. Now that your omelet is ready, place it on a dry cutting surface, and slice it into 2cm thick slices. you can use it either as a topping for nigiri sushi, or as a filling for temaki and maki sushi. 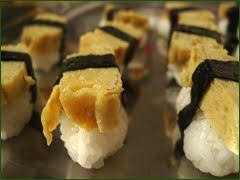 If you want people to say ” blooeeaahhhhh” then make tamago sushi.